Taste test: There's no discernable difference between these and Cooler Ranch flavor Doritos. 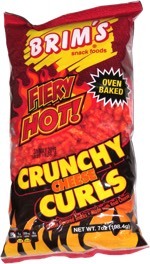 Grab a bag of these, a bag of the Cooler ranch flavor, find Sammy Sosa and do a "Pepsi challenge" with your eyes closed. I'll bet you won't be able to taste the difference. Even the "lick the powder off" test to see if the chip was inhibiting our taste buds didn't work. These are exactly like Cooler Ranch. From the package: “The tortilla chips so LOUD they'll break through the sound barrier! 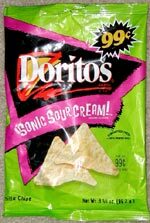 The COOL tang of sour cream blends with nacho cheese, tomato and SPICES for a creamy taste that'll send you into ORBIT!” Yeah, whatever.